Global Alzheimer’s Drugs Market expected to generate revenue of around USD 5.66 billion by end of 2024, growing at a CAGR of around 8% between 2018 and 2024. Alzheimer’s is a neurodegenerative progressive disease. Alzheimer's disease is a type of dementia which includes a broad group of brain diseases, such as problems with memory, thinking, and behavior for a long term. The report covers forecast and analysis for the Alzheimer’s drugs market on a global and regional level. The study provides historical data from 2015 along with a forecast from 2018 to 2024 based on revenue (USD Billion). The study includes drivers and restraints for the Alzheimer’s drugs market along with the impact they have on the demand over the forecast period. Additionally, the report includes the study of opportunities available in the Alzheimer’s drugs market on a global level. In order to give the users of this report a comprehensive view on the Alzheimer’s drugs market, we have included competitive landscape and analysis of Porter’s Five Forces model for the market. The study encompasses drug class, distribution channel, and regional segmentation are benchmarked based on their market size, growth rate, and general attractiveness. 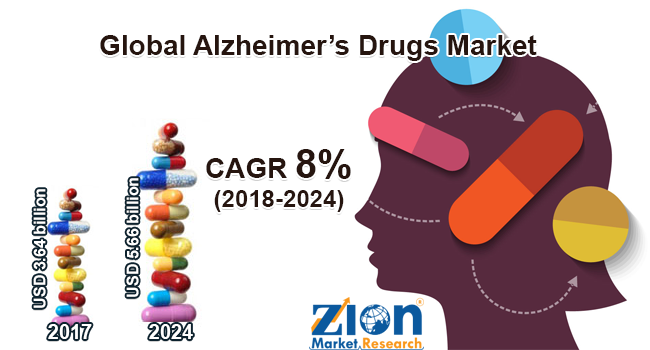 The study provides a decisive view on the Alzheimer’s drugs market by segmenting the market based on drug class, distribution channel, and regions. All the segments have been analyzed based on present and the future trends and the market is estimated from 2018 to 2024. Based on drug class, Alzheimer’s drugs market has been segmented into cholinergic, memantine, and combined drug. Based on the distribution channel, Alzheimer’s drugs market have been segmented into hospital pharmacy, retail pharmacy, and online sales. Growing occurrence of diseases in developed Western countries, the prevalence of number of neurodegenerative diseases such as dementia has grown in countries such as the U.S, steady government support for Alzheimer’s drug development, and growing awareness about the treatment of Alzheimer’s disease are some of the factors that drive the market growth during the forecast period. Additionally, growing geriatric population are the major factor driving the patient segment in Alzheimer’s drugs market with highest CAGR during the forecast period. The regional segmentation includes the current and forecast demand for North America, Europe, Asia Pacific, Latin America, and the Middle East & Africa with its further division into major countries including the U.S., Canada, Mexico, Germany, Spain, Italy, France, the UK, China, Japan, India, and Brazil. This segmentation includes demand for Alzheimer’s drugs market based on individual segment and applications in all the regions and countries. The report also includes detailed profiles of end players such as Ono Pharmaceutical, Johnson & Johnson, Daiichi Sankyo Company Limited, H Lundbeck A/S, and Eisai Co Ltd., among others.